Submitted photo Cedarville University mens soccer team needed double overtime to claim its Great Midwest Athletic Conference season opening win over Tiffin, Sept. 4. CEDARVILLE — Levi Haight converted a penalty kick midway through the second overtime to give the Yellow Jackets a 3-2 come-from-behind victory over Tiffin University in the Great Midwest Athletic Conference opener for both schools on Sept. 4. It was the second penalty kick of the contest for Cedarville (2-1) who was playing a man down after having a player sent off late in the first overtime. Cole Butaud was taken down in the box setting up Haight’s winner – his sixth career goal and his first from the spot. The Dragons had taken a 2-1 lead in the 84th minute on a shot that deflected off a CU defender. Derek Braak equalized just 37 seconds later with Butaud assisting. Tiffin (2-1) opened the scoring in the fifth minute. Nick Marculo knotted the score with 19 seconds left in the half on a penalty kick. Carter Selvius was credited with six saves in goal. The visitors outshot the Jackets 22-14 overall and 8-4 on goal. They hit the crossbar twice in the second half. Cedarville is 5-0-1 in their last six meetings against the Dragons. Tiffin still holds a 19-10-2 lead in the all-time series dating back to 1983. The teams plays at 5 p.m. Thursday, Sept. 6 at Walsh University in North Canton. For more information on CU athletics visit www.yellowjackets.cedarville.edu/. 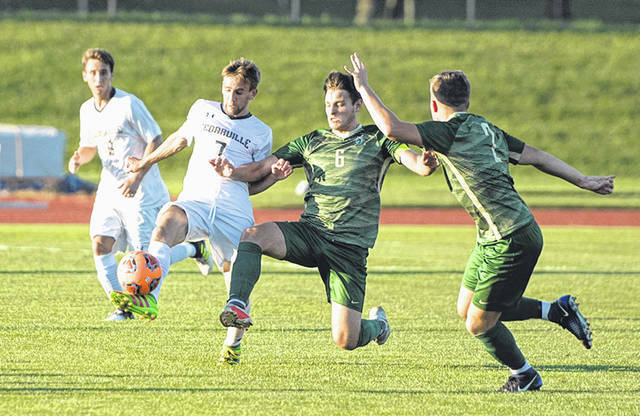 https://www.fairborndailyherald.com/wp-content/uploads/sites/50/2018/09/web1_cumen.jpgSubmitted photo Cedarville University mens soccer team needed double overtime to claim its Great Midwest Athletic Conference season opening win over Tiffin, Sept. 4.